Purpose For the quantitative determination of human BH3 interacting domain death agonist (Bid) concentrations in serum, plasma, cell culture supernates and cell lysates. 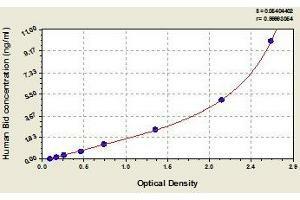 Specificity This assay has high sensitivity and excellent specificity for detection of human Bid. Protocol This assay employs the quantitative sandwich enzyme immunoassay technique. Antibody specific for Bid has been pre-coated onto a microplate. 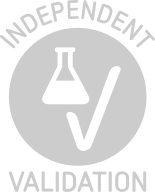 Standards and samples are pipetted into the wells and any Bid present is bound by the immobilized antibody. After removing any unbound substances, a biotin-conjugated antibody specific for Bid is added to the wells. After washing, avidin conjugated Horseradish Peroxidase (HRP) is added to the wells. Following a wash to remove any unbound avidin-enzyme reagent, a substrate solution is added to the wells and color develops in proportion to the amount of Bid bound in the initial step. The color development is stopped and the intensity of the color is measured. Product cited in: Lim, Loh, Ting, Bradshaw, Zeenathul: "Antiproliferation and induction of caspase-8-dependent mitochondria-mediated apoptosis by ?-tocotrienol in human lung and brain cancer cell lines." in: Biomedicine & pharmacotherapy, Vol. 68, Issue 8, pp. 1105-15, 2014 (PubMed).